The Sahara Desert covers more than 80% of Algeria. In fact, only 12% of the land in Algeria is inhabited. This is because over 90% of the Algerian population lives along the Mediterranean coastlands where the climate is more pleasant, and is similar to that of many Mediterranean countries. In the desert, the daily variations in temperature can be more than 80˚F (44˚C). Considering the vast expanse of desert, it goes without saying that one of the well-known Algeria facts is that temperatures can be scorching. In August 2011, temperatures in the oasis town of In Salah reached 123.8˚F (51˚C). This is the highest temperature ever recorded in the country. Sunscreen anyone? There are many Algeria facts relating to archeology. There are several ancient archeological sites dating back to the Neolithic era. 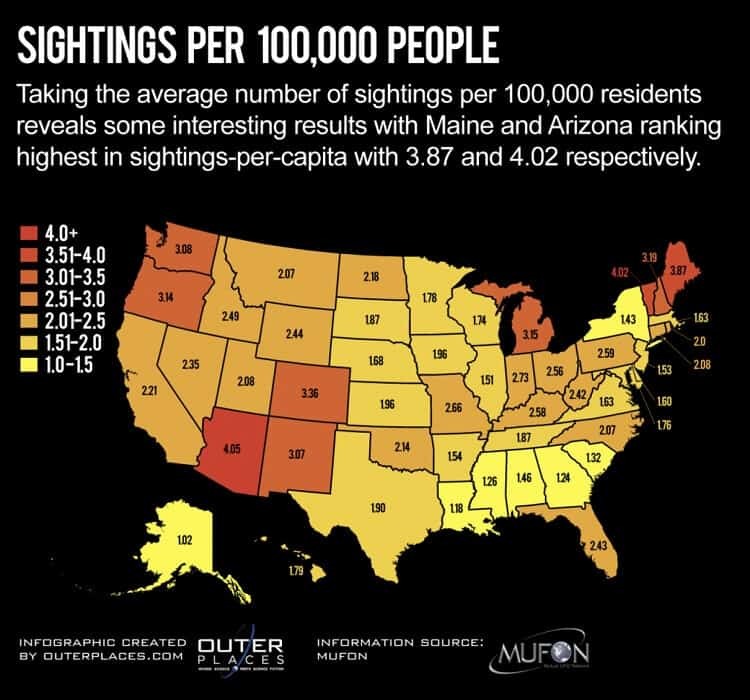 Many of these sites, some of which include examples of prehistoric rock art, can be found in the National Park of Tassili, known as Plateau of the Rivers, in Tassili n’Ajjer. In fact, this area is of such importance, it has been designated a UNESCO World Heritage Site. There are over 15,000 drawings and engravings, some dating as far back as 6000 BC. Other fascinating archeological sites include Djémila, Timgad, Tipasa, and the M’Zab Valley. If you’re interested in archeology, it’s time to pack your tools and book your flight to Algeria! One of the sadder Algeria facts is that many Algerians live in poverty. Incredibly, one in four Algerians lives on less than £1 a day. This is worsened by the fact that Algeria has the highest cost of living in North Africa. Poverty and unemployment has worsened in Algeria following years and years of internal conflict. The deterioration of natural resources is also contributing to this national problem. Algeria has had an interesting political history, which has generated many interesting Algeria facts. 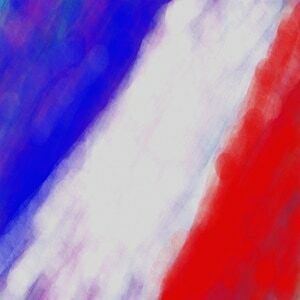 Over the years, it has been ruled by Romans, Germanic Vandal tribes, Byzantines, Spanish, Turkish and then the French. Algeria was in fact ruled by France from 1830, until it won back independence in 1962. Algeria’s fight for independence from France, which lasted from 1954 to 1962, resulted in the deaths of more than a million Algerians. The conflict between these two countries involved many atrocities, including marquis fighting, guerilla warfare, torture, terrorism, and counter-terrorism operations. The current Algerian flag was adopted on 3 July 1962. 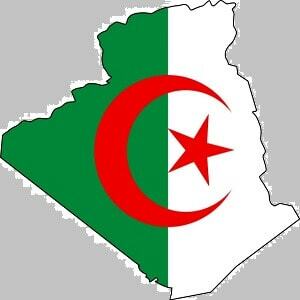 The colors and symbols on the Algerian flag are very precise and loaded with symbolic meaning. The red symbolizes the blood of those Algerians who died fighting for the country’s independence from France. 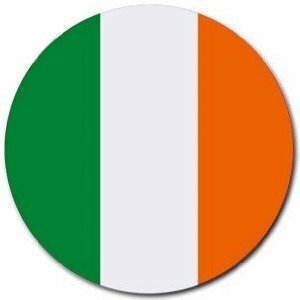 The green represents nature, whilst the white on the flag represents peace. The red star and crescent represent the Islamic religion. Of all the Algeria facts relating to the flag, the most surprising is that the colors are very specific: the exact wavelength that each color must absorb is officially specified. This is particularly unusual for a flag of an African country. Because Algeria consists mostly of desert, you wouldn’t expect it to produce a lot in the way of crops. However, one of the Algeria facts you might be surprised to learn is that this country produces agricultural products such as grapes, citrus fruit, wheat, cherries, figs, and dates. 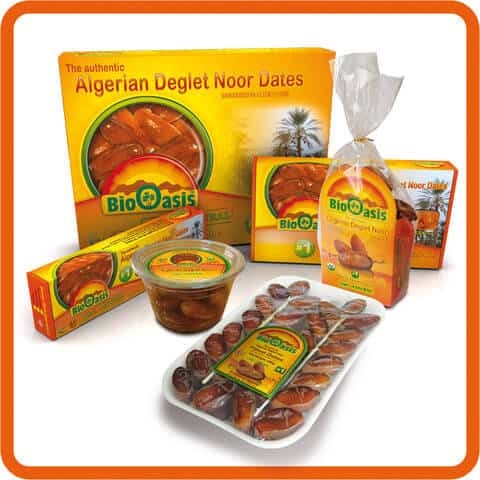 Algerian dates, including Deglet Nour, are regarded by many as the best in the world. 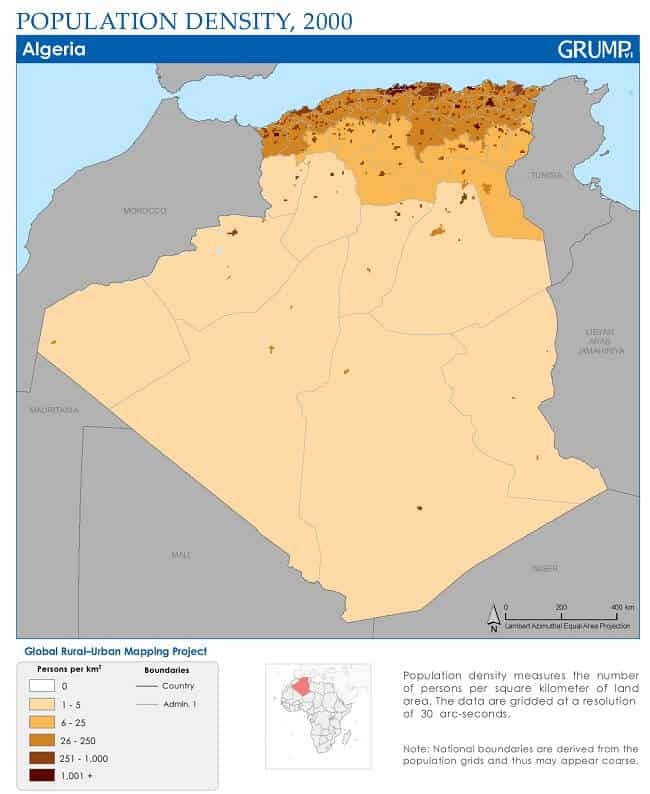 Interestingly, Algeria has the largest oat market in Africa. The main crops produced in this country are wheat, barley, and potatoes. Unfortunately, Algeria’s agricultural sector cannot meet the needs of the population, and 45% of Algeria’s food has to be imported. Although Arabic is the official language of Algeria, Algeria facts reveal that several other languages are spoken throughout the country. Because Algeria was under French rule for many years, French is widely spoken and is used in the school curriculum. Although English is not widely spoken, it is also taught in schools. The Berber languages, referred to as Tamazight; and Amazigh by their native speakers, are national (though not official) languages. These local languages are all closely related to one another. Although there is no such language as Algerian, there is Algerian Arabic, also known as darja, which is a local dialect of Arabic and is spoken by 60% of the population. There are several interesting Algeria facts relating to sport. Algeria has competed in every summer Olympic Games since 1964. During this time, which has seen 15 Olympic Games take place, the country has won a total of 15 medals, including five gold medals. They have twice won the men’s and women’s 1500 meters, and the fifth gold medal was for boxing. Two of these gold medals were won at the 1996 Atlanta Olympic Games: Noureddine Morceli won the 1500 meters and Hocine Soltani won the lightweight division in boxing. 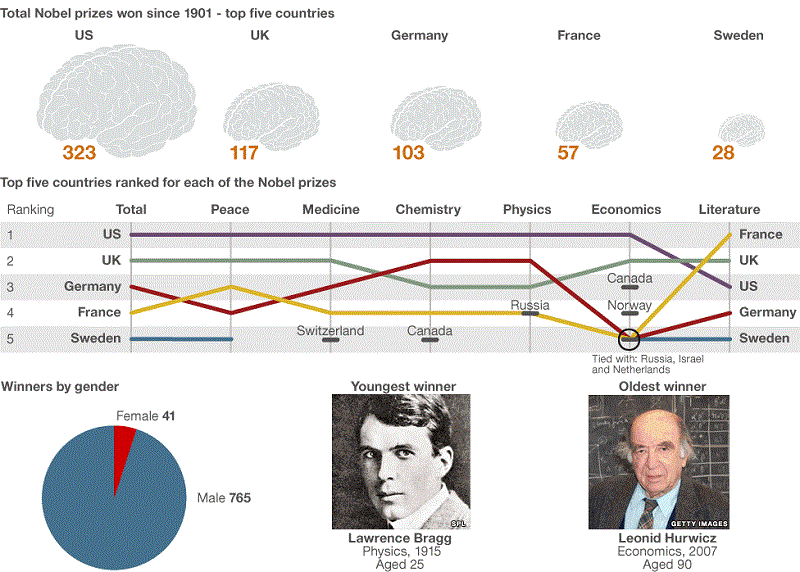 One of the more interesting Algeria facts is that two Algerians have won Nobel Prizes. In 1957, Albert Camus won the Nobel Prize for Literature. He was awarded the prize for his important literary production, which with clear-sighted earnestness illuminates the problems of the human consciousness in our times. Then, in 1997, Claude Cohen-Tannoudji won the Nobel Prize for Physics. He shared this prize with Steven Chu and William Daniel Philips. They were awarded the prize for their work in developing methods to cool and trap atoms with laser light. You will seldom find alcohol on sale in Algeria. This is largely due to the dominance of Islam in the country. Very few restaurants sell any alcohol at all. In addition, even if an establishment does sell alcoholic drinks, they will not usually list them on the menu. The trend for prohibition started in Algeria in 2005 and has forced sales and consumption of alcohol underground. It is reported that people drinking in secret has increased public health hazards, however. One of the more surprising Algeria facts is that women in this country have quite a lot of independence. 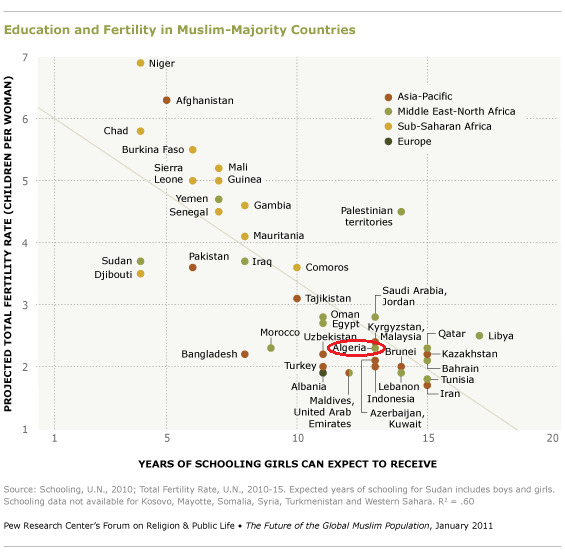 This is particularly surprising, because Algeria is an Islamic country and women in certain other Islamic nations tend to have a lot less freedom. In fact, Algerian women make a larger household income contribution than their male counterparts. In addition, Algerian women make up 60% of the country’s judges, 70% of the attorneys, and 60% of the student population. Therefore, Algerian women have actually gained quite a prominent status in their society. Another one of the Algeria facts pertaining to modern culture is related to pop culture. The Algerian singer Cheb Mami accompanied Sting on his song Desert Rose. This song featured on Sting’s album entitled Brand New Day, which was released in 1999. The duet was a worldwide hit, appearing in singles charts around the world. Cheb Mami subsequently enjoyed appearances on Saturday Night Live, Jay Leno, the Today Show, David Letterman, the Grammy Awards telecast, and gave a live performance at the Super Bowl. One of the more intriguing Algeria facts is that the fennec fox is the country’s emblematic animal. The fennec fox is native to the Sahara Desert in North Africa. As it is the country’s national animal, the Algerian soccer team is referred to as Les Fennecs. If you happen to be exploring the desert landscape in Algeria, as daylight fades, keep your eyes out for this tiny little fox with its enormous ears. Over the years, there have been several reported UFO sightings in Algeria. The earliest recorded UFO sighting was in 1970 in Algiers. Other sightings have been reported in Oran, Guerrara, Oued Bakrat, Bir El Djir, Zitouna, and Setif. Surprisingly, this relates to the Algeria facts about archeology. Some of the prehistoric rock art found in the country depicts what many people believe to be extraterrestrial aliens. So, when you’re in Algeria, keep an eye out for little green men in the sky! Algeria, located in North Africa, is the largest country on the continent. It consists mostly of desert, but has many interesting archeological sites. 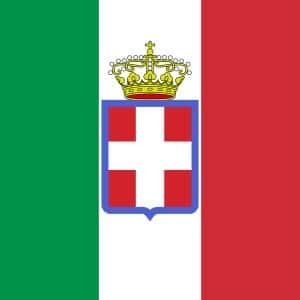 This poverty-stricken country won independence from France after being ruled by many different countries. Amongst other accomplishments, Algerians have won five gold Olympic medals, two Nobel Prizes, and the women have achieved significant status and independence considering Algeria is an Islamic country.